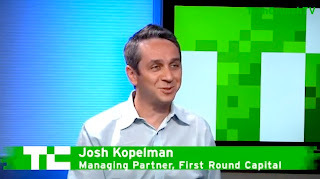 We know he gives great, "buffed up" holiday videos, but first Round Managing Partner Josh Kopelman (W'93, AEPi) also gives good advice. After the jump, for all you entrepreneurs out there considering starting a web business, check out a recent interview Josh did where he talks about customer acquisition and being careful about having too much "free" and not enough "free-mium". And for the entrepreneurs reading this, be sure to submit your application to appear on this Penn alum's upcoming TV show!